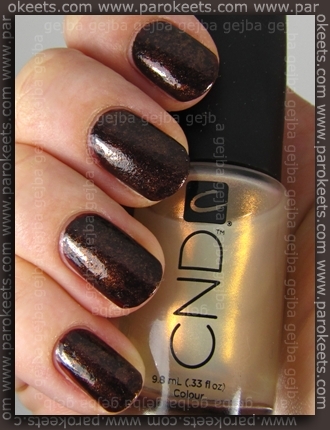 This time Maestra and I reviewed CND creme base polish Raisin In The Sun and Copper Shimmer effect. At first none of us was really into the base + effect combination. 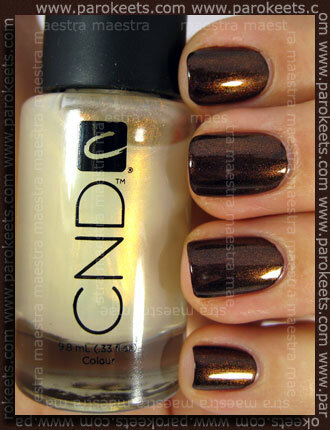 I just guessed it’s nothing new and I simply hated “old” CND polishes with their slow drying time. But last month Maestra and I stopped at NailSpa in Ljubljana and discovered the whole new world. We played with different bases and effect like little children play with their most loved toys. 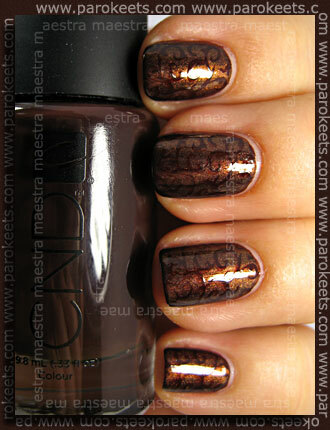 The owner of the NailSpa was kind enough to give us Colour Raisin In The Sun and Effect – Copper Shimmer to play with at home. I was impressed with the creme base. Brush is made with somebody like me in mind. I just can’t remember the last time the polish was so easily transfered onto my nails. I liked the fact that Raisin In The Sun is not “just” brown polish – it has this pretty reddish undertone you can see in little bit stronger light. I butchered one of my kitchen sponges and applied Copper Shimmer effect with it. I did plan putting Konad over the sponge, but I loved the manicure too much to alter it in any way. Effects are not made just from shimmers, glitter or mica. 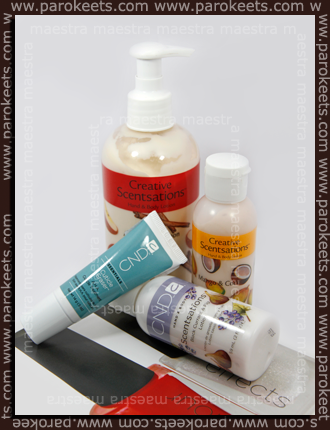 Combination of different ingredients is what gives them power to give life to creme polishes. I’m officially hooked. One of the effects is already mine and the other is on it’s way to me. I’m already plotting which polish will I use as base and show you what kind of a difference can effects make. What do you think about the transformations? 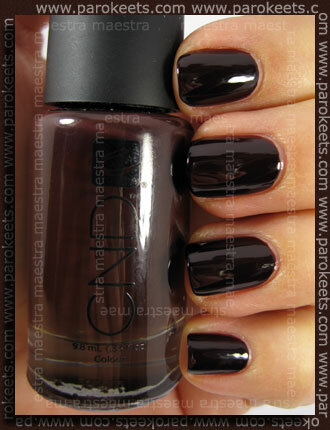 NailSpa decided to reward our readers with CND: Mango&Coconut 59,2ml and Black Currant&Fig 59ml lotion + Cuticle Eraser. whoever is the first one to correctly name both of the effect will win the prize. Al majo to tud v kakih salonih? Kok pa kej pride drugače? V LJ se jih dobi na manikurnem otočku v Supernovi (prvo nadstropje). Cena mislim, da je okoli 8 EUR, vendar nisem ziher. Raspberry sparkle in Amethyst sparkle? tole Maestrino manikuro pa mislim da sem videla v živo? noro lepo! 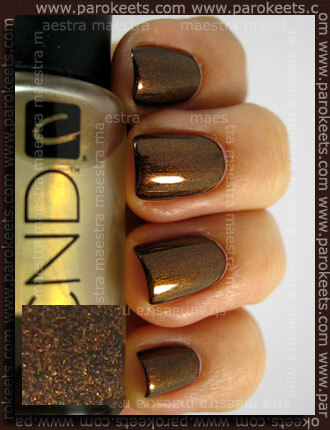 I love the effect the “effect” gives to the base polish, I think it’s a very interesting concept and I find the konad Maestra did is simply stunning! 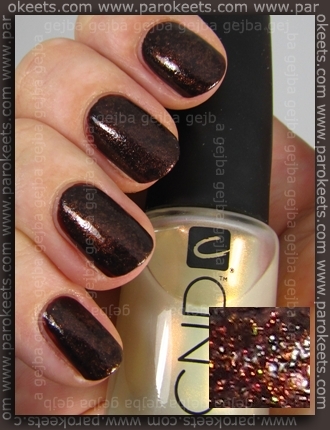 Citiram: Colour Raisin In The Sun ter Effect – Copper Shimmer, ki nama ju je lastnica otočka prijazno podarila.